1891: James Naismith invents basketball. 1936: Basketball becomes an Olympic sport. 1978: Kobe Bean Bryant is born in Philadelphia. 1989: Barack Obama meets Michelle Robinson. 1992: NBA players represent USA in the Olympics for the first time. 1992: Barack Obama marries Michelle Robinson. 1996: Kobe Bryant is drafted 13th in the NBA draft. 2007: Former Duke guard Reggie Love becomes Obama’s personal assistant. 2008: Kobe Bryant becomes an Olympian for the first time. 2009: Barack Obama is inaugurated as the 44th President of the United States of America. 2010: Kobe Bryant wins his fifth NBA championship as a Laker. 2011: Obama announces reelection bid. Feb. 2012: Michelle burns Barack on Valentine’s Day. July 8, 2012: Kobe Bryant is named to his second Olympic Team. 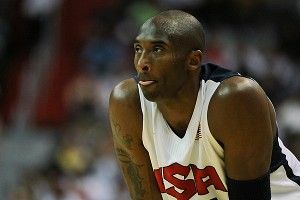 July 11, 2012: Kobe Bryant says his team would beat the 1992 Dream Team. July 16, 2012: Barack and Michelle arrive at Team USA’s exhibition against Brazil. • Barack and Michelle sit in their courtside seats. 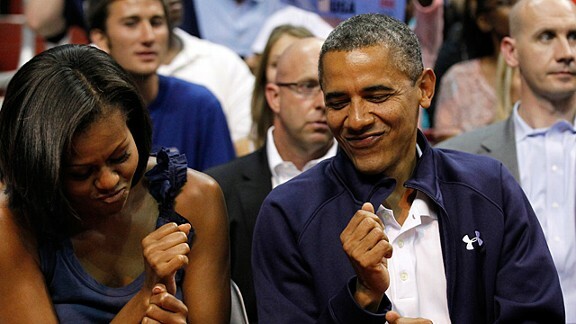 • Barack and Michelle dance in their courtside seats. • Barack and Michelle land on the KISS CAM and then DON’T KISS, despite his seventh-grader-at-the-movies-arm-around-the-shoulder technique and ever-so-slight lean-in. • Barack and Michelle land on the Kiss Cam for a second time, but then KISS because daughter Malia gives Barack the signal to go for it and make out with her mom. He attempted to save face by following this statement with, “But he makes the important decisions, so it’s all good,” but the real Kobe had already spoken. You have to respect a guy who will take on anyone in the free world, from Michael Jordan to Barack Obama, and subtly dis their abilities to do things like be the ultimate champions and make out with their wives in front of the entire world.